Regular check-ups with your GP and ResSleep are a vital part of your overall sleep apnea treatment. You wouldn’t go too long without visiting a doctor or a dentist, because you know it’s good for your health. So when it comes to ensuring that your sleep apnea treatment is up to scratch, we suggest the same– a regular check-up with both your doctor and our sleep therapists.There are some things in life that need to run like clockwork - and the journey to improving your sleep health is no different. While you might feel as though you’ve ticked a major ‘to-do’ item off your list having starting sleep treatment for a sleeping condition such as sleep apnea, you should view your treatment as part of your on-going journey to better sleep health. It might sound like a big commitment, but trust us - it helps to put aside a small amount of time to have regular therapy check-ups. Not only can we help you select the appropriate sleep treatment suitable to your individual need, but we’re here for you throughout the process too. If you schedule a check-up with us, our team can download and review your therapy data and go through this with you so you can see exactly how it’s working. We can also inform your GP of any updates. The journey doesn’t stop once you’ve had your setup on your sleep therapy. Like many things, time can create change and an appointment will allow a professional to reassess how you’re responding to your treatment. You may find that after some time your needs will shift and you might suggest to try a different mask or setting on your CPAP machine. It’s also important that you know when to replace your supplies1. We can help organise a service of your mask and machine. It might be something small, but fixing a little niggle can help your CPAP treatment. Is your mask leaking or is your machine unusually loud? 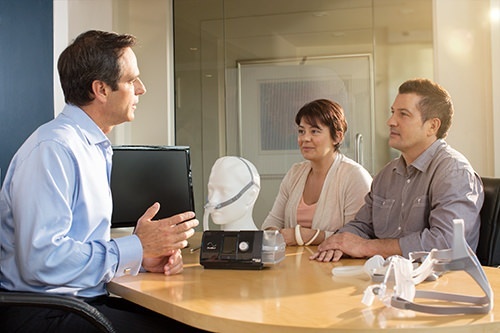 We can assess your CPAP mask, machine and humidifier. Even if your equipment is functioning freely, you might be experiencing a dry nose or a sore throat. We are here to help discuss these niggles and will partner with you to find a solution. We can update your equipment. At ResSleep, we are innovative and are constantly striving to offer our clients the best of the best when it comes to sleep therapy and solutions. You might not be aware of any of the latest sleep apnea treatment products, but that’s OK – leave that to us! If you take the short amount of time to have a check-up with us, we can guarantee that we’ll keep you in the know of any new equipment which might assist you to sleep – so you know that the very best technology available is always at your fingertips. How often do I have to book in a check-up? While your own sleep therapists might have a specific schedule for you to stick to when it comes to a follow-up routine, we generally recommend at least an annual check-up. However, if for any reason you do notice a change with your treatment or equipment every night, please call us as soon as possible. Book your follow-up appointment with us today. Now that you can see the reasons as to why you should keep in touch with our experts, it's time to book your follow-up appointment.